A spokeswoman for First Lady Melania Trump said she isn’t worried about being on the next cover of Vogue magazine. “To be on the cover of Vogue doesn’t define Mrs. Trump, she’s been there, done that long before she was first lady,” Melania Trump’s spokeswoman Stephanie Grisham told Fox News on April 12. 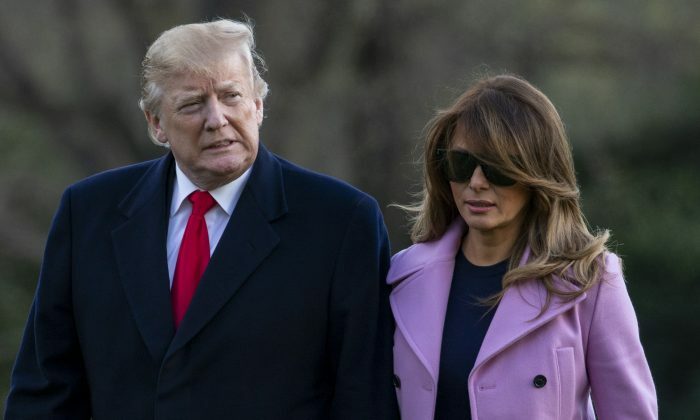 The comment comes after Vogue editor-in-chief, Anna Wintour, who was a vocal supporter of Hillary Clinton during the 2016 election, suggested that Melania wouldn’t be featured in the fashion magazine. “Her role as first lady of the United States and all that she does is much more important than some superficial photo shoot and cover,” Grisham told Fox. “Unfortunately, Mrs. Trump is used to this kind of divisive behavior,” Grisham added. Wintour was recently asked by CNN why the magazine features female leaders and first ladies on its fashion covers. However, Melania hasn’t been featured once on the magazine since she began residing at the White House in January 2017. Clinton and Michelle Obama, former first ladies, have been featured several times with glowing coverage. In the interview, she again lauded Obama, who was featured three times on the cover of the magazine. Conde Nast, owned by Advance Publications, is the parent company of The New Yorker, Wired, Vanity Fair, Pitchfork, GQ, Glamour, Bon Appétit, Ars Technica, Allure, and Reddit. Melania was featured on Vogue’s cover in 2005 when she married Donald Trump.